Yesterday I ran this year’s first Cashflow 101 game for my clients. It turned into a beautiful sunny day which was just as well as we were playing in my garden office. I have written before how powerful these games are for all concerned, including for myself as banker/facilitator. I absolutely know that this is the most powerful work I do as a coach and mentor in the area of money and wealth creation and yesterday’s main learning for all of us seemed to be around being happy to receive. All the players were women, this may be irrelevant, but it seems to me that women are especially happy to give, give, give but considerably less comfortable when it comes to receiving. On the Cashflow days I facilitate two games, one before lunch where we play by the rules, and one after lunch where we throw the rules out of the window and make it all up as we go along when it comes to how we are going to craft deals and collaborate with one another, start working as a team, giving, receiving, everyone “winning”. Everything in the game is a metaphor for how you run you life when it comes to money and all the learning is transferable to your real life if you are brave enough and dare to translate the learning into changes in your behaviour. More than one game is vital to embed this into your psyche and create new habits and ways of thinking and taking action in your business, your life and with your money. After lunch, my latest new thing is to encourage players to tithe ten percent of funds incoming into a central pot from which all may draw when and if the need arises. Towards the end of the day when we get tired and perhaps two players are out of the rat race and the remaining five are still struggling, we start to use the funds in the pot for the benefit of all. Players are gifted stake money to do deals, remember they too have contributed to this pot. They are invited to pay it back fourfold, so it isn’t “free”. And yet we still feel uncomfortable taking what we perceive as charity. Somehow it seems to us less valuable perhaps than if we had done it all by ourselves. This sort of revelation – that a deal might come to you easily, that you can still make money out of a deal you cannot afford to do by yourself, that you can join in with others and it be fun and you still make money lightly and easily, all this is alien to us to begin with. But continued play reveals this is all just rubbish we have inherited and deepened ourselves and that we might simply change our minds, open our eyes and see opportunity all around us. 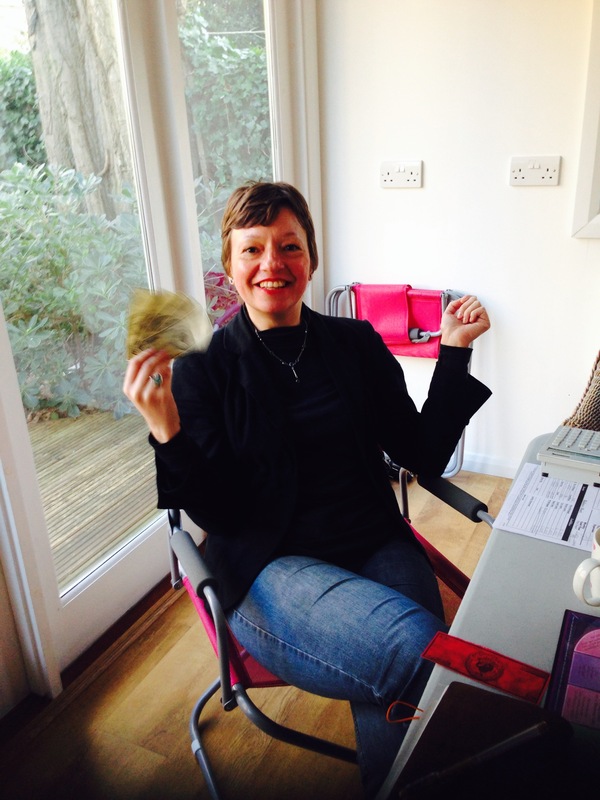 If you would like to play Rich Dad’s game, Cashflow 101, with me in The Abundance Shed in Streatham Hill, London, just use the Contact form to send me an email and I will notify you of upcoming 2014 playdates. Meanwhile here’s a photo of Moneybags Diane Leigh fanning herself with a fistful of $10,000 notes. That was easy! Next game is scheduled for Saturday 19th April 2014 – Easter Saturday: Book here at Eventbrite for donations.